Gothenburg is Sweden’s second largest city and a popular foodie destination. People must have noticed my Instagram updates from the city in September because Gothenburg (and the local name Göteborg/Gøteborg) is currently the most popular search terms on this site – counting hundreds of requests. I’ve also gotten loads of personal messages about it: “Where is the foodie guide to Gothenburg?” Well, here it is – finally. Stockholm and Malmö have always been more interesting destinations for me, but after this visit, I realized I need to go back to Gothenburg more often. Even with a long weekend in the city, we couldn’t manage to cover much of it. Except, the coffee scene – we covered a good part of that. Hotel Pigalle (ad: affiliate link) is located right next to Nordstan shopping mall and the central station, just across the main canal, smack in the middle of Gothenburg. 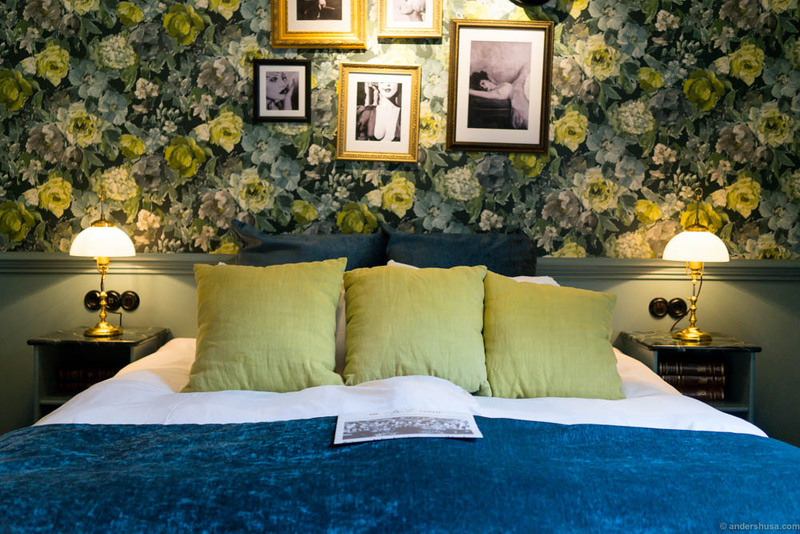 It’s a boutique hotel with a 1900s Parisian style, Molin Rouge-esque design with flowered wallpaper, red velour, green marble, chandeliers and old lamp shades, dim lighting, lots of vintage looking picture frames and top hats everywhere! 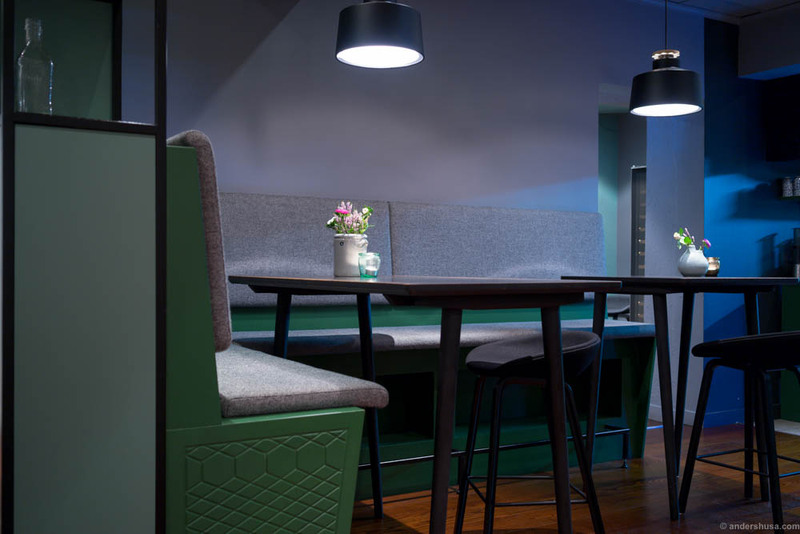 We quickly realized that Hotel Pigalle was more than just a facade of design, though, it was also about excellent service. “Excuse me, mister Husa,” a voice called after us as we were about to climb the stairs. “I almost forgot to give you this,” he said and handed me a small thin cup with two ice cubes. It was for the bottle of vieux carré that awaited us in the room. Just what we needed! 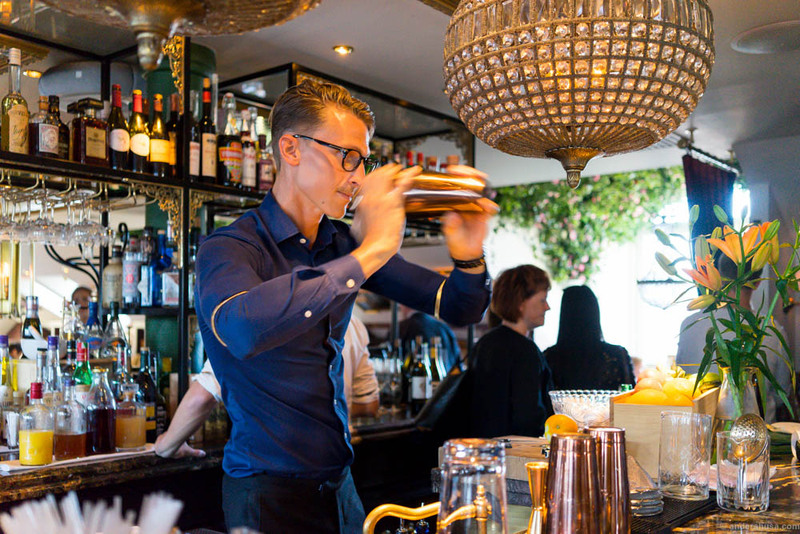 A welcoming drink – wow! After a long drive from Oslo, we were also in dire need of a cup of coffee, so we headed for the first stop on our extensive Gothenburg coffee tour. The city has many black watering holes worth checking out, and Viktors kaffe is definitely one of them. Nina Simone played over the speakers as we entered this friendly neighborhood coffee shop. A very passionate barista by the name of Johan manned the bar. He was experimenting with a new batch of coffee and invited us to taste along with him. While Johan whistled in tune with the jazz music an old man walking his dog came inside. “Can I check today’s newspaper? I just want to read the TV guide. What do you charge for a cup of coffee?” he asked. “35 kroner,” Johan smiled. “What do you charge for a cup of tea then?” “30 kroner,” Johan replied. “Then, I’ll have tea please,” the old man said. 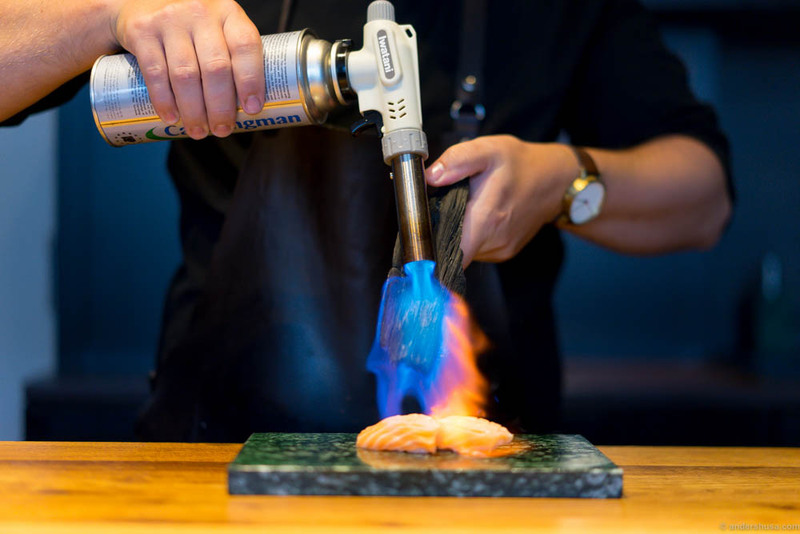 Hoze is a Nordic-Japanese sushi restaurant with authentic flavors, techniques, and presentation in line with the old Edomae sushi traditions of Japan. 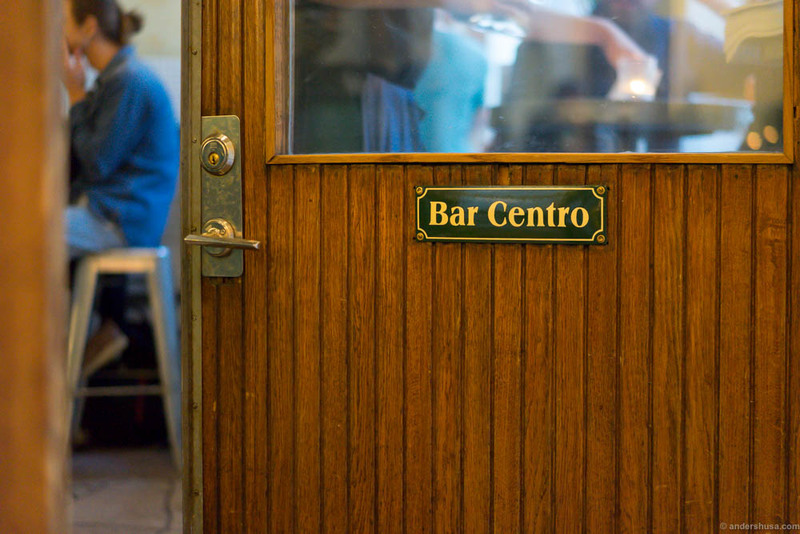 It is run by chef José Cerdá, while his dad, Gabriel Cerdá, is the tiny eatery’s only waiter. Hoze has been on my top to-visit list in Gothenburg for ages. Finally, we managed to score a reservation at two of the six highly sought-after seats in a restaurant that is open only four days a week. A 22-course meal awaited us, and that’s simply too much to cover in a guide like this. Read the full foodie story soon in a separate post. 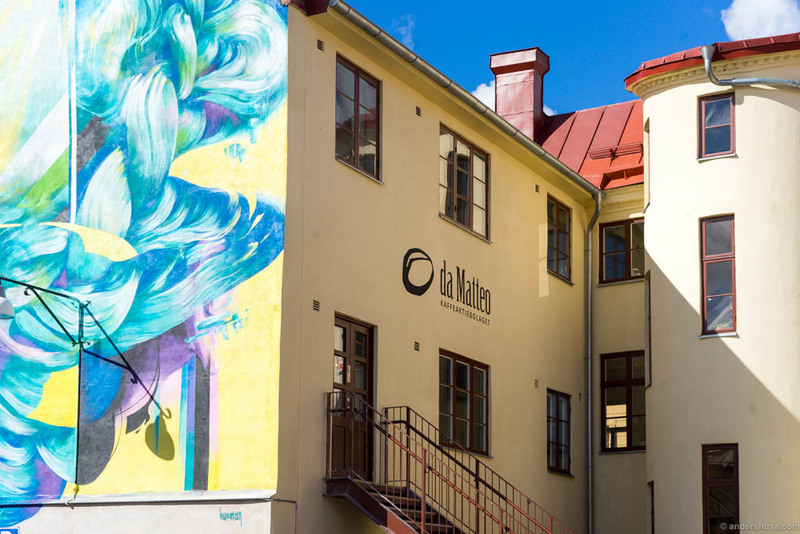 The original Da Matteo coffee shop is the one in Victoriapassagen. 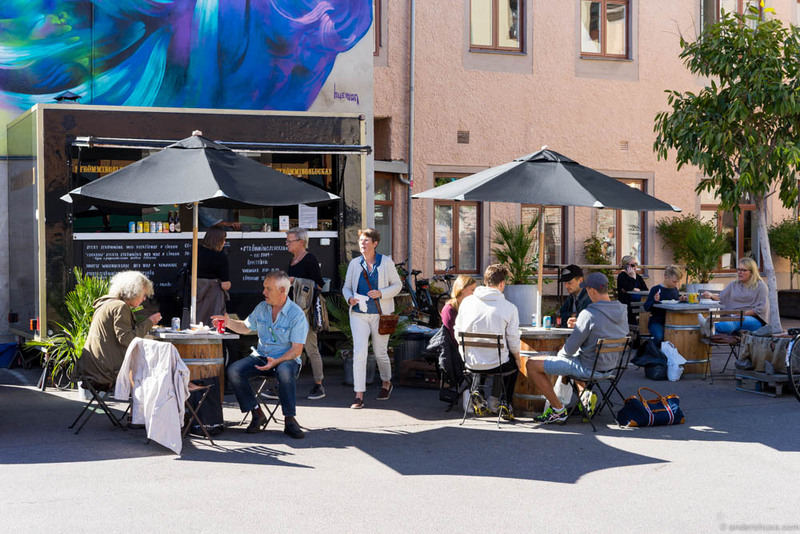 To make a long story short: the founder Matts Johansson opened one of the city’s first espresso-based coffee shops in this location called Caffé Espresso. Later on he sold it and moved to Italy for a few years, but later reopened again as “Da Matteo” – meaning “at Matteo’s place.” Today, he owns four coffee houses, a sourdough bakery, and a roastery and is the city’s most prominent coffee salesman. Feskekörka – the fish church – is a religious building for those who believe in the Nordic deity Njörðr – the God of sea & fish. Not really, it’s not even a former church, which you might have guessed given the building’s unique architecture. 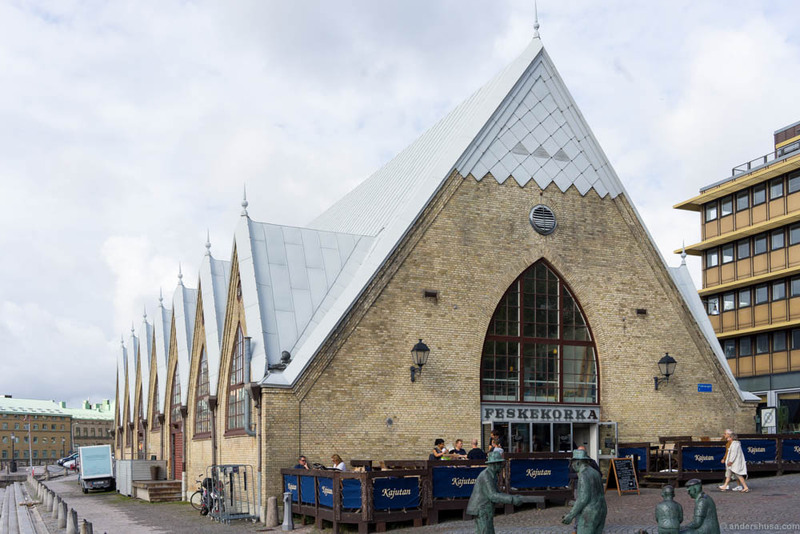 Feskekörka is actually a fish market and a kind of food hall for seafood and the name is just a Gothenburgian joke. We went here to visit restaurant Gabriel on the second floor, famous for their oysters and run by the World Champion Oyster Opener 2016 Johan Malm. A ridiculously tasty whipped brown butter served in an oyster shell (of course) was devoured at the speed of light along with the selection of three types of bread that came with it. Next up was an oyster from Grebbestad, opened by the master himself and paired with an Ostronporter (oyster Porter) from Grebbestad brewery. We also had a small taste of house classics like fish soup with caraway, herring in mustard mayo & Västerbotten cheese served on potatoes, “löjrom” & sour cream on a buttery toast and “Skagenröra” – Swedish shrimp salad on rye bread. I sat next to the wonderful Björn, who had driven all the way from his home in Skåne to experience this famous seafood restaurant. Go here early, by the way! At 12 PM the queue escalated quickly. Whipped brown butter and bread. So good! 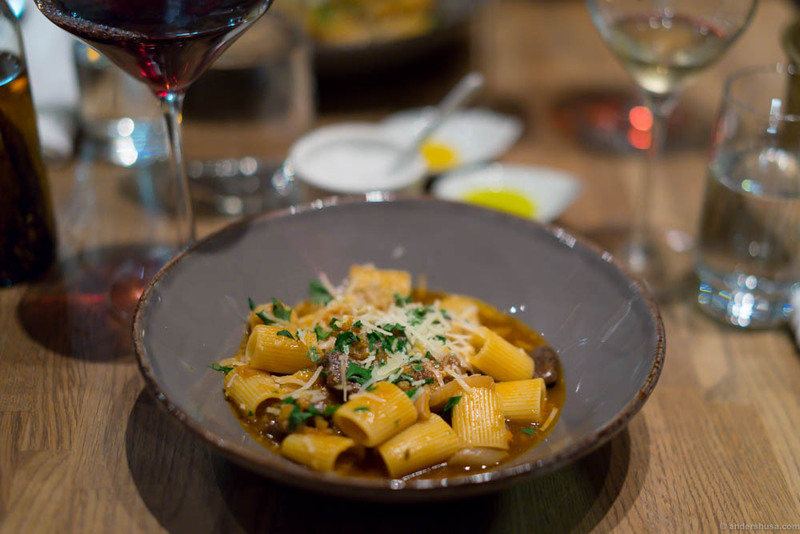 We had left one night open in our schedule in case we got some local recommendations, and José Cerdá at Hoze was the first to suggest that we pay Trattoria La Strega a visit. Later on, we got the same tip from other industry people in Gothenburg. Trattoria La Strega is something as unique as an old school authentic Italian trattoria, where the sommelier has a fascination for natural wines. 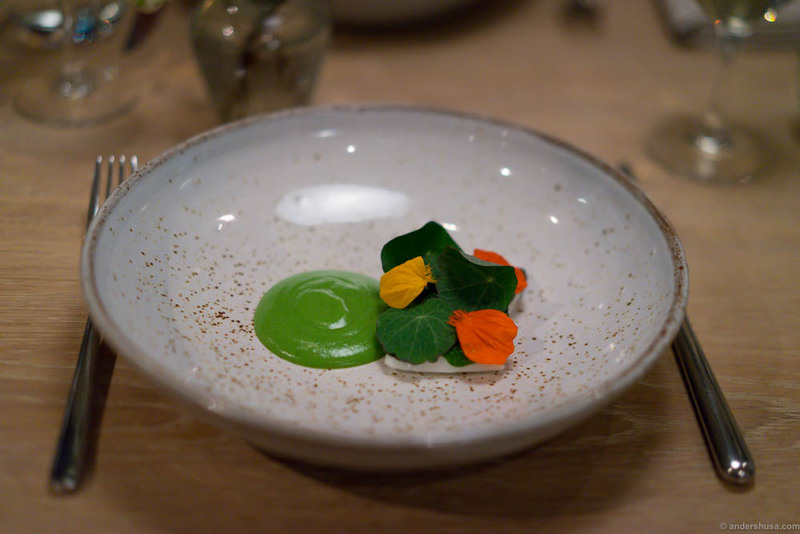 We’ve grown accustomed to the typical places for natural wines being small hipster bistros serving New Nordic-style, vegetable-focused food, so this was quite a contrast. Lammidia Bianchetto – fantastic natural wine! Being on a foodie trip is hard work. Sometimes you have to eat cake for breakfast. Since we tried to cover most of the city’s coffee scene in just a few days we had to visit Kale’i Kaffebar for a traditional Swedish “fika” – coffee and a snack. Of course, we could have chosen among the sourdough sandwiches, salads and soups they offer, but the cakes were right there in front of us. Kale’i Kaffebar was recognized as Sweden’s best café in the White Guide in 2016 and recently moved to a bigger location. Restaurant Atelier is situated on the top floor of Hotel Pigalle and offers a menu of Swedish produce and European influences. Immediately, as the elevator doors opened, I knew that I wanted to sit at the marble counter of the cocktail bar, surrounded by copper colored shakers and jiggers and small bottles of bitters everywhere. I love to sit in the bar of restaurants when possible, especially if you dine alone or as two. In the bar, we could watch the bartender work on our cocktails, and it was easy to order another drink when we wanted. “The menu consists of à la carte dishes right now, but we’ll change to an autumn set menu soon,” restaurant manager Niklas Jansson explained. My favorite plate was the potatoes & “löjrom” with smoked silver eel. “From North to South” – Crushed new potatoes with sour cream, Kalix caviar, spring onion & smoked silver eel. Omnipollo Mazarin, pale ale brewed with oats, in the glass. Dinner this evening was in another bar, focused only on natural wines – Bar Centro. Despite an early arrival, the place was packed with people, but luckily there was a free table for us in the passageway outside. I would recommend you to book, though. Upon entering we instantly liked the unique atmosphere of the place but fell completely in love when it turned out they offered Matassa by the glass – one of my favorite natural wine producers at the moment. Bar Centro reminded me somewhat of 10 William Street in Sydney and La Buvette in Paris. Simple bar food with a lot of character. 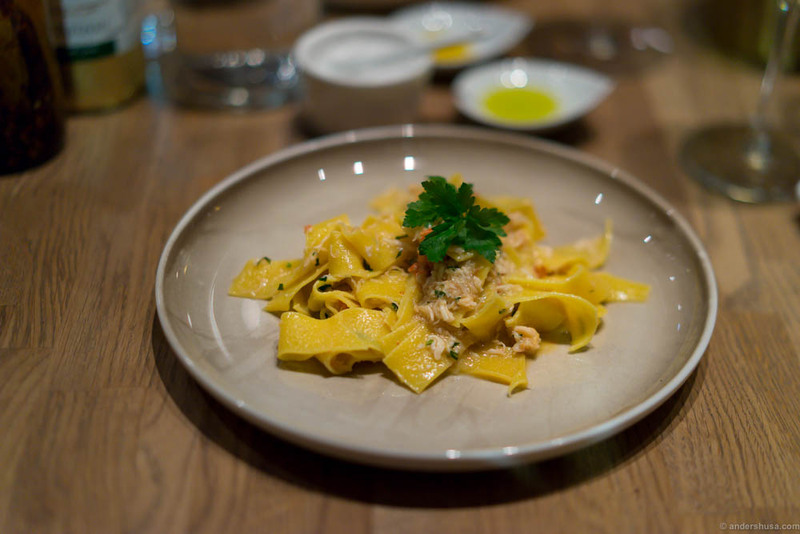 Just the kind of food that chefs like to eat on their days off, and on those terms you could say that Bar Centro is the Pjoltergeist of Gothenburg. I don’t usually bother with hotel breakfasts when I’m in a new city, but having eaten lunch at the rooftop restaurant Atelier the day before, I learned that breakfast was served in the same place. Thus, the next morning we took the elevator up again. Hotel Pigalle has a very decent selection to start your day. Choose between yogurt natural or vanilla flavor, or even the thicker quark variety. There’s loads of different toppings, nuts, seeds and berries. In addition, you can get bread and spread, hams and cheese, and even warm food freshly prepared by the kitchen. Mind you, they were starting to run out of that around 10 AM. We were satisfied with a müsli, a cup of coffee and one of their homemade juices. Yogurt, müsli, berries, juice and coffee. Perfect start. Another day and yet another exciting schedule. First stop was Da Matteo in Magasingatan, where we were fortunate enough to attend a coffee cupping session with Da Matteo’s head roaster Christian Gullbrandsson. I’ve been to a few cuppings before in Oslo, but this was a private class and very exclusive. For those who wonder: cupping is a technique used to observe the taste and aroma of coffee. You can book several different courses and barista classes from Da Matteo here. Christian started by grinding each type of coffee in separate cups, while he told us about the different regions of origin and what characterized their flavor profile. We stuck our noses into each cup and smelled the freshly crushed beans. Next up, Christian poured water at around 90-95 degrees C into each cup and waited approximately 4 minutes. He then used a spoon to break the surface, which causes all the coffee ground that floats on top to sink to the bottom. Now, it was ready for us to sniff and slurp and try to describe the mouthfeel, acidity, sweetness, bitterness and character. Ethiopian coffee really has a unique flavor, in my opinion! Da Matteo’s roastery, as well as its sourdough bakery and pizzeria, is found in Magasingatan, which is literally just across the street from their other coffee bar in Vallgatan. In between the two shops is a public square populated by street food vendors. Strömmingsluckan is probably the most famous, serving traditional fried herring and mashed potatoes since 2009. Instead, we tried the steam buns at the relatively newly opened Jinx food truck, which is parked right next to Korv United. Steambuns with slow cooked pork from Jinx food truck and a Omnipollo Bianca Mango – Gose brewed with rock salt, lactose and mango purée. A mango lassi gose! Choosing among the fine dining restaurants in Gothenburg was the hardest task, as there are so many good options. In the end, we chose Bhoga after a long round of research and consulting other foodies. We did not regret. Bhoga is a great value for money, contemporary, elegant New Nordic restaurant in the heart of Gothenburg with a view to the canal. Gustav Knutsson and Niclas Yngvesson are experienced chefs who have worked at Michelin-starred restaurants around the world. Now, they focus all their knowledge and creativity into creating a 5-course (SEK 600), 7-course (SEK 750) and 9-course (SEK 900) tasting menu. They were rewarded with one Michelin star in 2014 and the White Guide has awarded the place heavily as well. We had the lovely restaurant manager Sara Rönnerman taking care of us this evening as we explored the full 9-course menu. However, we skipped the wine menu and asked for a few recommendations by the glass from the sommelier instead. All natural, organic or biodynamic wines from small producers, by the way. The meal started off with a small plate of snacks before it moved on to a handful of beautiful seafood platters like langoustine, mackerel, and turbot. At this point, I thought the place was more about presentation than taste, but that quickly changed as we moved on to the vegetable dishes. Some of my favorites this evening included the grilled celeriac with rainbow trout roe, the tartlets with chanterelles & Wrångebäck cheese and the Jerusalem artichoke, potato & shaved truffles from Gotland. Leaving Gothenburg and heading for Copenhagen, we had one more pit stop to conclude our coffee tour. Alkemisten kaffebar & kafé is located in the area Kvillebäcken across the bridge Götaälvbron – and was a strange but cozy place. The V60 coffee was round and full of flavor, but the croissants were dry and tasteless. Maybe the barista could sense that, because shortly after he offered us a taste of the biscotti and an espresso to dip it in. Much better! I need more days in Gothenburg! Maybe weeks. There are so many places I want to visit next time. The following fine dining establishments all have one Michelin star and looks exciting: SK Mat & Människor, Upper House, Thörnströms Kök, Sjömagasinet (the city’s oldest Michelin-starred restaurant) and Koka. The latter even has a more casual place called Spisa. The Barn is another place that seems highly popular. I’d also like to both eat and stay at hotel Dorsia, which I think is somewhat similar to Hotel Pigalle. If we had more time we would also have explored the food market Stora Saluhallen. Alas! Next time. What are your favorite restaurants, bars, coffee shops and hangouts? Please share in a comment below. This travel guide is sponsored by Visit Sweden. All the places were selected by me, and the sponsor had no influence on the recommendations or content of this article. I received no monetary payment. The guide contains an affiliate link to booking.com. Great guide! Me and my girlfriend try to visit Gothenburg a few times a year, lots of great food and coffee there . Koka and Bhoga are my favourites. Thanks, Bo! I hope to visit Koka next time. 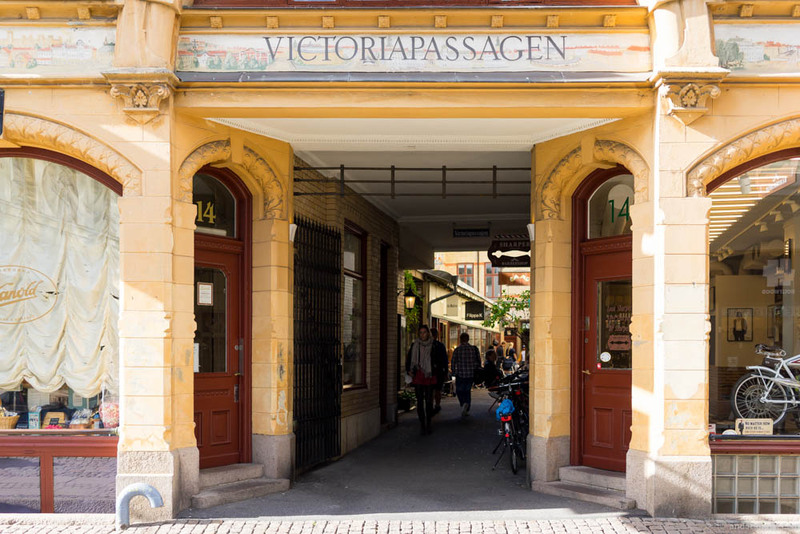 Well actually 28+ is Gothenburg’s oldest Michelin starred restaurant and well worth a visit! Really? Then my source was wrong. Well, that looks interesting too. Thanks. You must try Bord 27 Next time, really great! Thanks, what kind of a place is it? Next time, come say hello to us at “Champagnebaren”. You will love it! Thank you, I will look it up. I went to Gothenburg about a month ago and really enjoyed Bhoga og Koka. I hope you get the chance to try Koka next time, the wine selection is excellent! Bjorns bar, wine bar below the restaurant, is also fantastic! I did not realize that feskekörka closed at 15.00 on Saturday, and is not open on Sunday, I missed it but I am happy to see you managed to get there. Personally I really enjoyed saluhallen, even if it is quite simple it is a great atmosphere, several cozy restaurants, and really good value for money. Came back here several times to try the different places. Some none food related things I enjoyed was to take a walk in trädgårdsföreningen, a park open in the daytime, with a lot of flowers and greenhouses with event more exotic flowers. I guess this was closed when you visited, but Paddan sightseeing boat is a really fun way to learn some of the history, and to get to know the city a bit. Thanks for the new recommendations, will try to visit Bar Centro next time I get there! Thanks, Ulrik. Koka is high on my list indeed. You should definitely try sjöbaren in haga, really nice fish restaurant with cozy interior design, I really enjoyed the fish based creations in the menu! Plus they have a great outdoor space, a must try on a sunny day! Thanks for the recommendations, I’ll keep in mind when I’m back there! Great review, except for [email protected]&£ing Bar Centro. Less than mediocre everything . And cash only?? Had to go to a cash machine. Very annoying. Sad to hear that. It’s new owners and a new food concept since my visit, but others I’ve spoken to said it was good. Cash only in Gothenburg is really weird. The trend in Gothenburg and Malmö is card only.